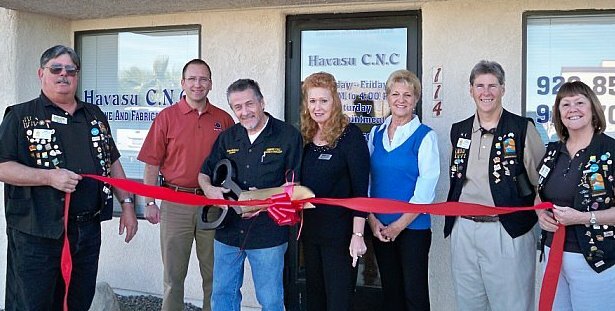 The Lake Havasu Chamber of Commerce Ambassadors held a ribbon cutting for Havasu C.N.C. Machine and Fabrication, LLC. Havasu C.N.C is a custom machine ship with CNC capacities on tool room quality lathes and milling machines, specializing in custom machinery projects using aluminum, stainless steel, carbon steel, tool steels and some exotic metals. Havasu C.N.C is located at 1080 Aviation Drive Unit 114, Bldg. A and can be reached by calling 855-4454. Attending the ribbon cutting ceremony from left to right are: Mike Schuler, Larry Deptula, Alan & Charlotte McGrevy, owners, Bonnie Steen, Rick Broker, and Kathie Schuler.